Foreharbor, Gotts Island, Watercolor by © John R. Gillis. America had shores long before it had an interior. Its western edge was first colonized by Asian migrants arriving by foot. The second colonization was by ship, this time from the east. But the latest and most transformative colonization comes not by sea but from land, from the interior. It threatens not only to obliterate the nature of the shore but to obscure its history. John Cheever remarked that in New England we now have “a second coast…of gift and antique shops…” John McKinney, who knows the California coast as well as anyone, has remarked that on its boutique waterfronts it is impossible to see the “shores for the stores.” A man-made coast now overlays nature’s shore, threatening not only the natural environment, but the built environment itself. Shores and coasts have distinct histories. Long before there were coasts, there were shores. Coasts arrived quite late in human geography. The term coastline did not appear until the eighteenth century. Yet, today Kenneth White notes that “looking at a globe, what strikes the eye most are coastlines,” echoing Ralph Waldow Emerson’s observation that “the point of greatest interest is the place where land and water meet.” Coasts are a feature of modernity. They reflect a desire for order, rationality, and mastery over nature. They belong to the era some want to call the anthropocene, a world in which everything, including nature, is subject to human design. Coasts promise order and predictability, not just for the mariner seeking safe harbor but for the landlubber keen on fixing the line between land and water, banishing age-old fears evoked by the sea. Today, however, coasts are evidently failing in that purpose. The very thing that was supposed to bring order to what Rachel Carson calls that “elusive and indefinable boundary” of the shore is evidently the cause of ever greater chaos. To understand this paradox it is important to understand the history of how shores became coasts. Shores and coasts have distinct histories… Coasts are a feature of modernity. They reflect a desire for order, rationality, and mastery over nature. Humans have had a very long, though largely unrecorded, history of living not only on but with the sea. It began roughly 165,000 years ago, when, due to unfavorable climatic conditions inland, Africans came down to the sea at the southern tip of their continent. There they discovered an ecotone where two ecosystems, one of water, the other of land, intersected, offering those who crossed the tideline riches far greater than found inland. The place that Carl Sauer later called the first home of humankind, Homo sapiens found a place to “eat, settle, increase, and learn.” In time they became what ecologists call an edge species, adept at exploiting both sea and land. The shore was also the initial home of Europeans, first in the Mediterranean and later on the edge of northwestern Europe, where people who arrived as mobile hunter-gatherers made their way alongshore in pursuit of their prey, eventually settling estuaries and moving inland along rivers. The Vikings thought they were sailing around the edge of a great north sea bay when they initially island hopped from Iceland to Greenland and then to Newfoundland. They did not know that they had crossed the Atlantic because in their minds it did not exist as a space between the old and new worlds. Later, Europeans who followed Columbus recognized that they had sailed across rather than around a sea, but, apart from the Spanish, who plunged inland in search of mineral riches, most came as fishers, hunters, and traders, remaining coasters rather than inlanders. The Native Americans they encountered on this continent’s edges shared with them their transient character, also moving alongshore to fish, hunt, and trade. For the first hundred years of contact, these peoples, sharing common environmental and aquatic values, proved quite compatible. American history is usually told as a story of westward movement, from sea to shining sea, when, in fact, until the mid-nineteenth century it was more maritime than territorial. It will be remembered that Columbus set sail not with intention of finding a new world, but reaching an old one. His goal was passage to India, and he, and all those who followed, were frustrated to find a continental landmass blocking their way. Until the nineteenth century, explorers kept the hope alive that the shores they encountered were those of islands they might sail around them to reach the fabled East. The vision of an archipelagic America did not die easily, for until the eighteenth century the whole world was conceived of as islands. The notion of continents had emerged in the 16th century, but was not naturalized until the nineteenth century when Americans came to see themselves as continental. The Europeans who explored North America were island and shore peoples who viewed the world in archipelagic terms. Here they encountered peoples with the same metageography. Natives of Virginia informed Captain John Smith that the world was “flat and round like a trencher, and themselves at the midst.” The English, French, and Dutch empires were all seaborne and archipelagic. The English had been island hopping, first to Ireland and then across the Atlantic since the 15th century. And until the mid-seventeenth century, the biggest prize continued to lie offshore, in fish-rich waters rather than on land as such. North America was initially known to Europeans entirely from the sea. The interior remained terra incognita. While the discovery of shores was assumed to carry with it a claim to the hinterland, early explorers were less interested in possession of land than passage around it. In a map of 1651, Virginia is shown to be insular, with Sir Drake’s New Albion (California) just beyond its western edge, giving easy access to the “The Sea of China and the Indies.” In one of the first sermons preached in the Massachusetts Bay Colony, Robert Cushman gloried in the fact that it too appeared to be an island with access to the Far East on its western shore. At first, that which lay inland held little interest. One of the first things young Francis Billington did when he disembarked from the Mayflower was to climb a tall tree with a westward view, reporting “a great sea, as he thought.” It turned out to be only a pond, which even today is called the Billington Sea. If our coasts are to have a sustainable future, we need to provide them with a intelligible past, one that acknowledges the fact that the shore was the first home of humankind. Neither the east nor the west coasts were initially conceived of as the edge of land but as a unique space, a frontier, constantly moving both landward and seaward. Initially, shores remained placeless places, temporary camps for fishermen and traders, whose dwellings were makeshift and portable, allowing periodic retreat when winter came or storms threatened. Like native shore dwellers, Europeans initially used the shores lightly. By the mid-seventeenth century, shores were beginning to be settled by a hybrid population of farmer-fishers, but these were still as much oriented to sea as to land. For such amphibious peoples, the coast was not a line, not an edge or a barrier but a place of transit and circulation. Until the mid-nineteenth century, the economic and political strength of the United States was bicoastal rather than interior in character. It became a continental power not because of its overland prowess, but because of its maritime capacities. Like its eastern counterpart, the western shore was explored and settled by water. And it was the search for safe harbors rather than arable lands that justified the possession of Oregon and California. The western shore was first prized as giving access to the Pacific and for a very long time it would remain more important as a way station than a place of permanent settlement. Thus, it was by sea, not land, that California and the rest of the western shore was populated. Chinese fishermen felt at home on the shores of San Francisco Bay, while Boston merchants made Monterey and later Honolulu into little Bostons. Shore societies have always been diasporic and cosmopolitan in nature. Belonging exclusively neither to land nor sea, they are more open and permeable than the interiors. Shore people are defined more by the routes they traveled than by their roots in a particular place, one of the reasons that for centuries they have been seen as somewhat alien by inlanders. In the period roughly 1850-1970, America turned away from the sea, transforming its shores into coasts. This was due in part to the industrial revolution, which gave precedence to production over trade as the basis for the nation’s wealth and privileged the great heartland cities. Linked to the interior by road and rail, seaports became more connected to both the deep interior and places around the world, but no longer maintained alongshore connections. Fishing cut its ties with the land and moved ever farther offshore. The coasting trade declined, smaller ports decayed, and coastal and island populations precipitously declined, leaving the shores to be recolonized in the late nineteenth and early twentieth centuries by inland folk seeking not employment but leisure, pleasure rather than sustenance. the coast as the last unsullied frontier. The old coastal communities suffered a fate not unlike Native Americans. They were doubly displaced, losing their place on the shore but also becoming in the minds of the newcomers the last vestiges of a lost way of life. Many a fishing village and working waterfront first became a tourist attraction and later a maritime heritage site. World War II had brought unprecedented militarization of America’s coasts, but in the age of intercontinental bombers and missiles they ceased to be the country’s first line of defense, opening up the shore to civilian uses. The real transformation came in the 1970s with the restructuring of the economy, shifting of industrial production overseas, largely to Asia, and changing America’s function from that of the world’s dominant producer to the globe’s greatest consumer nation. With the advent of the container ship and the supertanker, world trade boomed and the sea took on an importance it had not had since the nineteenth century. But commerce no longer flowed through the old seaports like New York and San Francisco, but through a whole new set of mechanized terminals located elsewhere like Bayonne, Long Beach, and Oakland. The shift to air travel accelerated the decline of the old waterfronts, whose piers quickly rotted and seafaring populations virtually disappeared. Yet, it would not be until the 1980s that the possibilities of this empty space dawned on urban developers. Once it did, cities on the sea would be transformed beyond recognition. Today the sailor towns are gone. Few who live in the new waterfront high-rises have any material connection to water. It is for them entirely a space of leisure, a visual experience. They live on the sea, but have no experience with it, except when storms and tsunamis bring it crashing into their otherwise wholly landed existence. For millions who live far from coasts, shores nevertheless occupy a prominent place in their mindscapes. They take up a very large space in the popular imagination, and are now a defining feature of national identity for all Americans, treated as inalienable heritage and precious natural resources to be defended against all enemies, natural as well as human. After Hurricane Camille in 1969 American flags were seen flying everywhere on the Mississippi coast; people responded to the Alaska oil spill as if had happened in their own backyards. Whole inland regions now identify with coasts, which increasingly provide them with a collective identity. Maine touts its Lobster Coast, New Jersey has its Shore, and California is defined by its beaches, with what Kevin Starr calls its Coast of Dreams. People have also become possessive of coasts for personal reasons, associating them with precious childhood memories, youthful vitality, and comfortable old age. To understand why people now crowd the coasts the way they do, it is necessary to know that we not only live on coasts but by them mentally and emotionally. They are now closely associated with both our desires and our fears. In recent years Americans have come to identify with coasts as with no other geographical feature. They have become fiercely possessive of lighthouses, which have replaced church spires as regional symbols in New England and elsewhere. Lighthouses, which once protected seafarers now demand protection themselves, everywhere threatened by coastal erosion. But when sensible planners suggest they be moved back from the sea, locals denounce this as retreat. Seaside property owners also demand that inland taxpayers protect them from the sea, arguing that they are the trustees of a kind of national commons, even when they refuse access to beaches to their fellow citizens. Melville would be astonished at how many more Americans now come down to the sea, not to do, but simply look. To answer Melville’s question, one must consider the place of the sea in American culture, how it features as a final frontier, a replacement for the green fields that have been lost to urban and suburban development. Coasts are America’s favorite horizon, a place to project their dreams, but also to locate their worst nightmares. Close encounters with the coast had always been the mariner’s worst fear, but now the terrors come from the sea itself – hurricanes, shark attacks, and now tsunamis – fears which. Jaws affected not just beach goers, but people throughout the American heartland. Our seafaring nation has become a seafearing one. Few of our shores are any longer pristine. Natural beaches are rapidly replaced by artificial ones and protective wetlands are long gone. Native species of fish, birds, and animals are hugely endangered, but so to is homo littoralis. Few any longer make their living from the sea and the working waterfront is a rarity. Of the 5,300 miles of Maine’s coastline only about 20 can be described as functioning as a nexus between land and sea. Coves and headlands that were once home to active fishing and clamming communities are now lined with the residences of summer people. When fishing industrialized it concentrated itself in a few large ports. The ancient connection between farming and fishing was severed, and the latest coastal colonists no longer know how to live with the sea. To understand why people now crowd the coasts the way they do, it is necessary to know that we not only live on coasts but by them mentally and emotionally. They are now closely associated with both our desires and our fears. All around the world wetlands have been destroyed with disastrous consequences. Recent events on the Gulf coast show just how dangerous it is when waterworlds are subordinated to territorial interests. Right now it would not be an exaggeration to say that coasts designed to meet landlubbers needs are the greatest single threat to shores. What we witnessed at the time of Sandy was not a natural disaster, but a human one. how humans have lived with the sea if we are to cope with this latest episode of climate change. We have become dangerously alienated from nature, but, even more troubling is our alienation from our own human nature, as this evolved at the point where land meets sea. Around the world, coasts are not only crumbling physically, but the very idea of the coastline is being called into question. Ecologists how challenge the notion that nature conforms to lines. The coastline, what was once seen as the world’s most natural boundary has now been shown to among the most unnatural, a danger to itself but also to the shore and all its creatures, including ourselves. As Zygmunt Bauman has observed, the master metaphor of the twenty first century is no longer fixity but fluidity. As coastal environmentalists like Orrin Pilkey have shown over and over again, efforts seawall the shore have been the major contributor of to erosion. That which was meant to bring order into the world has proved to be a source of disorder. For a long time we could not see the shore for the coast, but now, in the nick of time, the blinders are off. Scientists are just beginning to understand the dynamics of the land/sea interface, and archaeologists and historians are tracking the divergent histories of shore and coast, showing how they came in confict and suggesting how they might again be reconciled. While it may not be possible to ever return our shores to something like the condition we found them in during the nineteenth century, I am convinced we can learn to live with them again in a lighter, less self-deluded, descrutive manner. This afternoon I hope I have convined you to think of coast and shore as different things, to recognize how they are in tension, but how the current contradicitions must be faced headon if we are to deal with the coming crisis caused by global warming. by the Department of History and the Center for Cold War Studies and International History. John R. Gillis is Professor History Emeritus at Rutgers University, has taught at Rutgers, Stanford, Princeton, and the University of California at Berkeley, is a Life Member of Clare Hall, Cambridge, and now divides his time between two coasts: Northern California and Maine. John R. Gillis has authored several books including, Islands of the Mind, A World of their Own Making: Myth, Ritual, and the Quest for Family Values, and Commemorations and most recently, “The Human Shore: Seacoasts In History”. 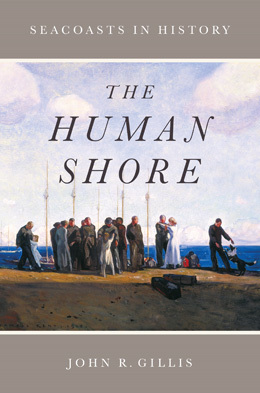 In this latest book “The Human Shore: Seacoasts In History”, published by University of Chicago Press, November 2012, historian John R. Gillis explores the deep history of seacoasts, the original home of humankind.